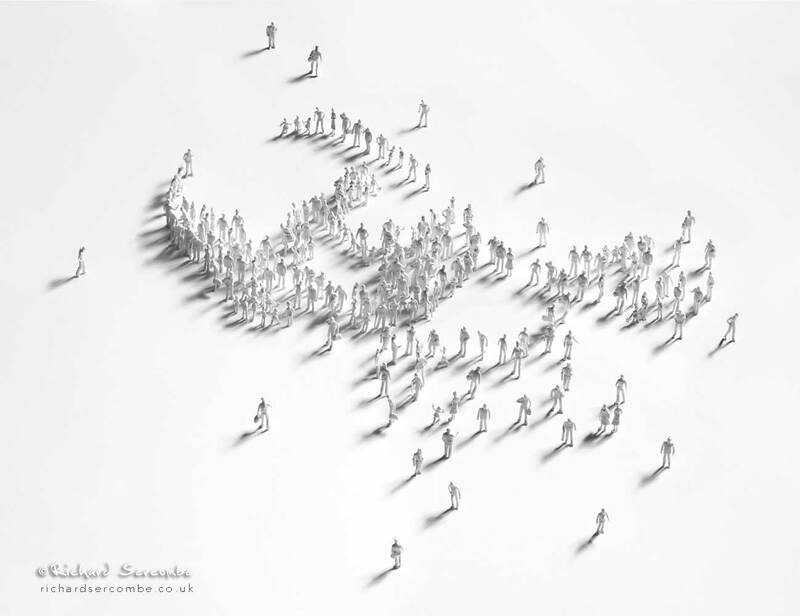 Richard Sercombe - For arts sake - Creative Photography. 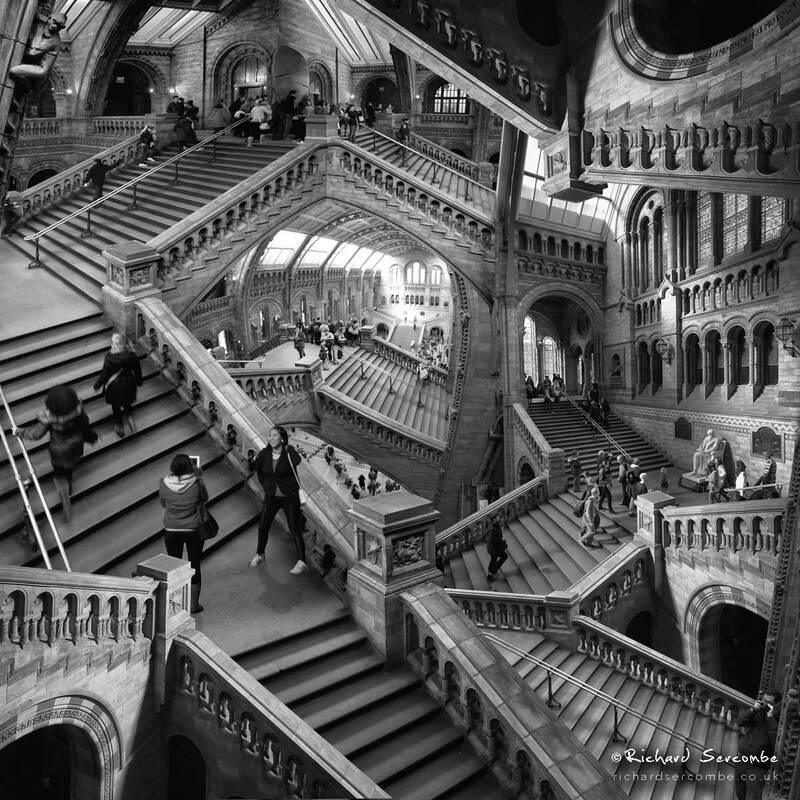 Seeing a photo of the interior of the Natural History Museum in London reminded me that at college I had a great fondness for the work of M. C. Escher and I figured that if I could plan a day out to come back with as many shots of the stairs from every available angle I might be able to re-create something reminiscent of one of those drawings. With this in mind and having the best part of a very enjoyable day out I was able to construct a 20 layer photoshop file made up of the two sections of stairway in the Darwin hall. I could not resist the inclusion of the monkey on the top left and I suspect that Darwin himself would love their presence throughout his room. My love of model railway figures stems from way back to my childhood when my grandfather set up a vast expanse of railway track taking up the majority of the attic. After leaving school my interest wained somewhat with the whole thing but a recurring theme I keep coming back to is the use of model figures as props. This is a homage to one of the pioneers of the model railway. 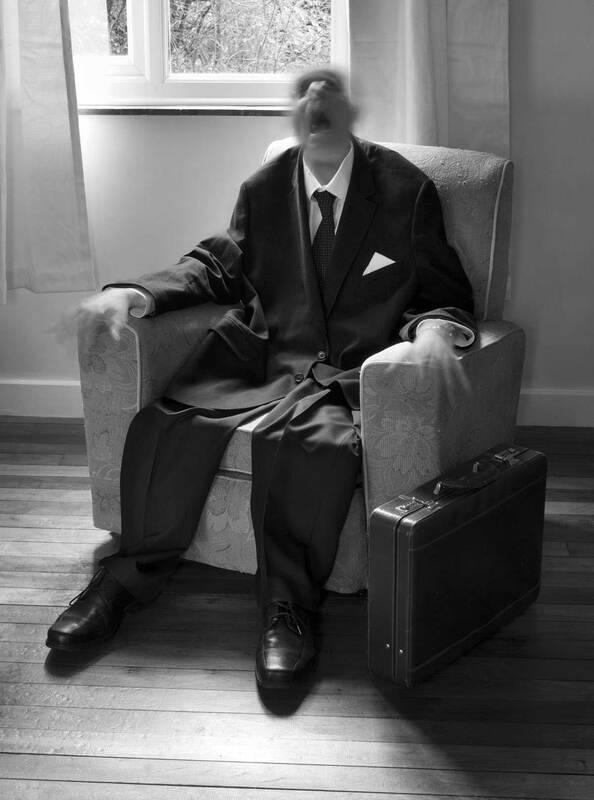 A portrait of Frank Hornby using nothing more than unpainted white figures selected from three packs of 100 all the way from china... thanks ebay! The Method: The whole figure position was first mapped out in illustrator, including the possible shadow lengths which would be determined by the height of the figures. I colour coded the trace to reflect this and marked them out on white PVC foamex before spending a whole day super gluing them all into place before the fun part of photography could be undertaken. This was inspired by a set of images that have stayed in my head since Art College. The screaming popes by Francis Bacon were so striking I decided to borrow an idea from a John Foxx record sleeve (the "Miles Away" single) and combine the two concepts in one. A simple double exposure was used to create the final effect.Natural lighting was used in conjunction with two flashguns to pick out some detail in the creases of the suit. The empty room with floorboards completed the effect. 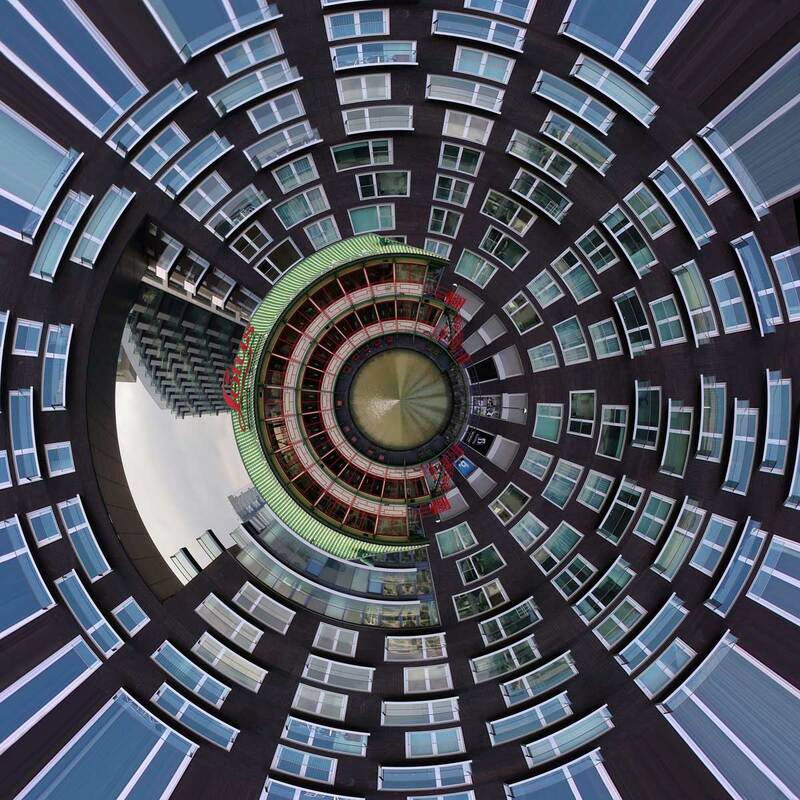 The opposite of the floating planet polar co-ordinates effect in Photoshop was used to create a graphic landscape out of the docklands in London. 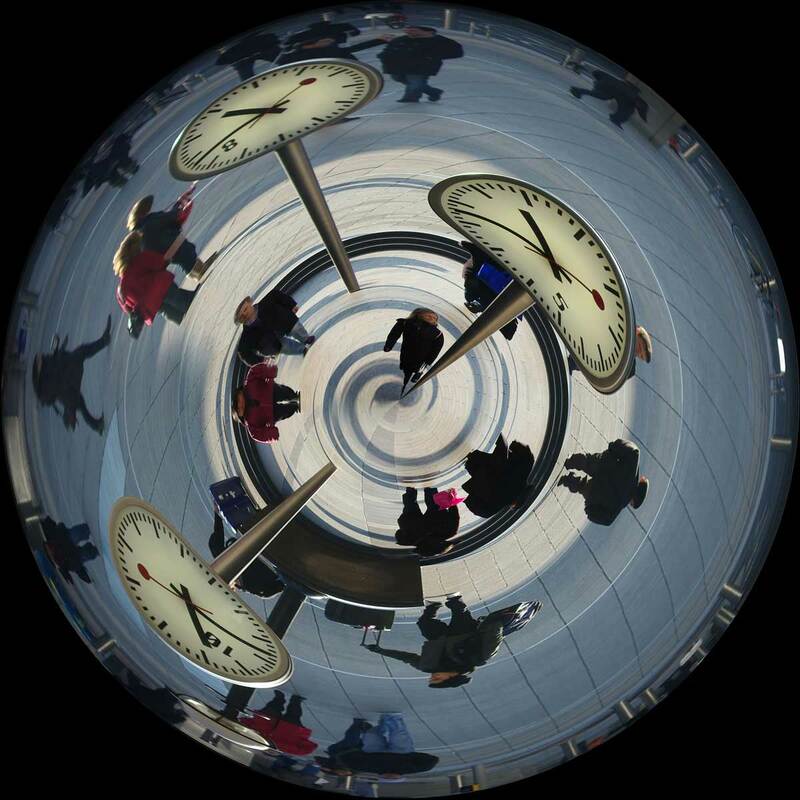 Floating planet using the clocks outside canary wharf station.